Firehouse Subs is a fast casual food restaurant chain that specializes in hot subs. 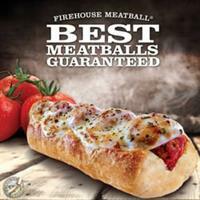 Founded in 1994 in Jacksonville, Florida, by former firefighter brothers Robin and Chris Sorensen, Firehouse Subs serves sandwiches with meats and cheeses, ''steamed'' hot and placed on a toasted sub roll. Locations offer a family-oriented atmosphere, with a firefighter theme that includes fire equipment throughout the store and a menu that features sandwiches with themed names. Pictures mounted on the walls highlight local firefighting history. Firehouse Subs was named ''Company of the Year'' by KPMG in 2006,and is the ''National Chain'' winner of the National Restaurant Association’s Restaurant Neighbor Award for community service. The Firehouse Subs Public Safety Foundation, Inc., a non-profit organization, was created in 2005. It provides funding, equipment, and support for local firefighters and other public safety organization. Customers are also able to contribute directly to the foundation by dropping spare change in donation canisters near the registers, ''rounding up'' their purchases to the next dollar, and purchasing leftover pickle buckets. Wellington Rd & Southdale Rd. From 401 take Wellington Rd exit (186) go North. (approx 3kms) on your left hand side.